All images © DC Comics. The DC series CRISIS ON INFINITE EARTHS brought an end to the previous Wonder Woman continuity, making way for a fresh start. 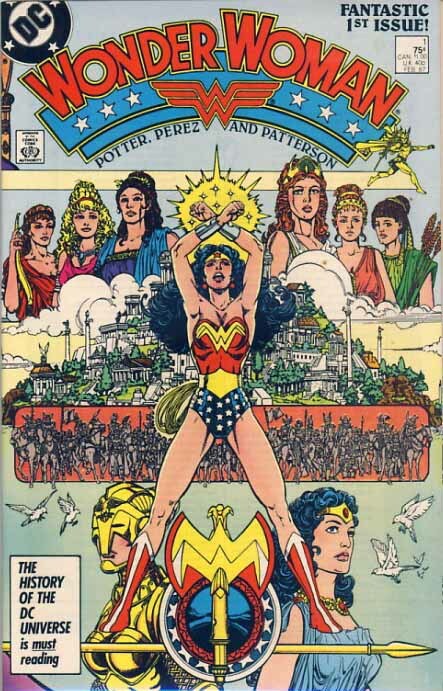 This came from writer Greg Potter and plotter/artist George Perez, who took charge of the revamp, bringing in lots of research on Greek mythology. 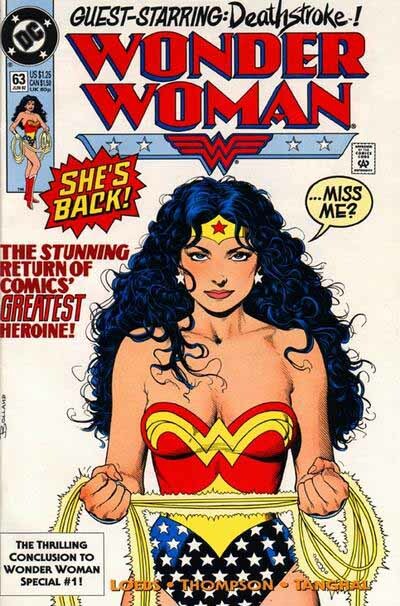 Potter soon dropped out, and Perez charted Wonder Woman’s course for over 60 issues in a fan-favorite run, the first of which is shown above. 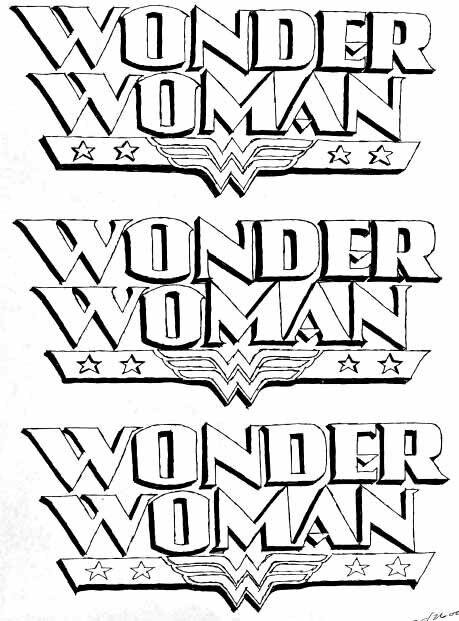 The new logo for this series was designed by letterer Ken Bruzenak from an idea probably by DC art director Richard Bruning. 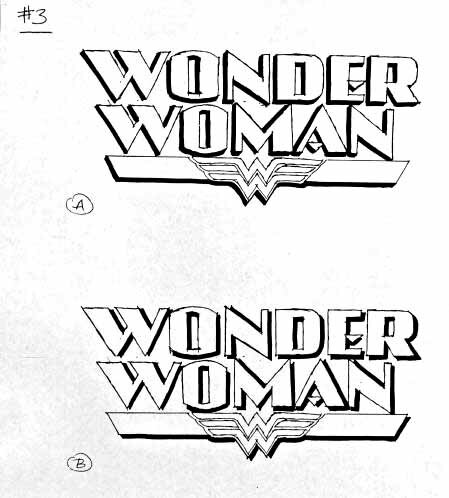 The logo still needed to incorporate the relatively new Wonder Woman emblem of stacked W’s, and a row of six stars, another feature of her costume ran in a wide open bar to either side of that. Below, another smaller bar was added. The letter forms were sans-serif block composed only of straight and circular elements, similar to the font called AvantGarde, and probably many others. 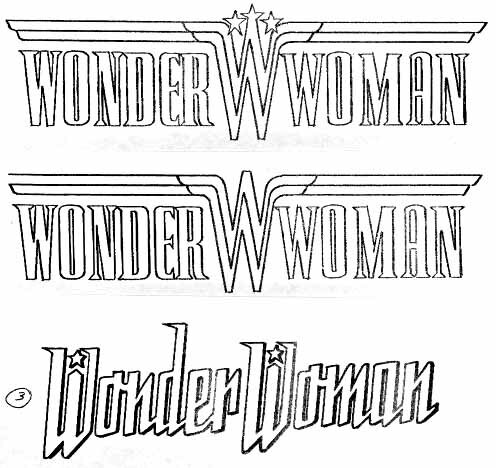 Following a similar plan to past logos, the W’s were larger, but here for the first time the letters were on one line and overlapped, which helped conserve space. With such classic forms that didn’t create any problems with readability. The overall arc of the logo and it’s depth took up quite a lot of space on the cover, and while it’s not the case here, it would be bound to overlap detailed artwork by Perez in many cases, so a thin outer shape around everything made a color-break between the logo and the art. 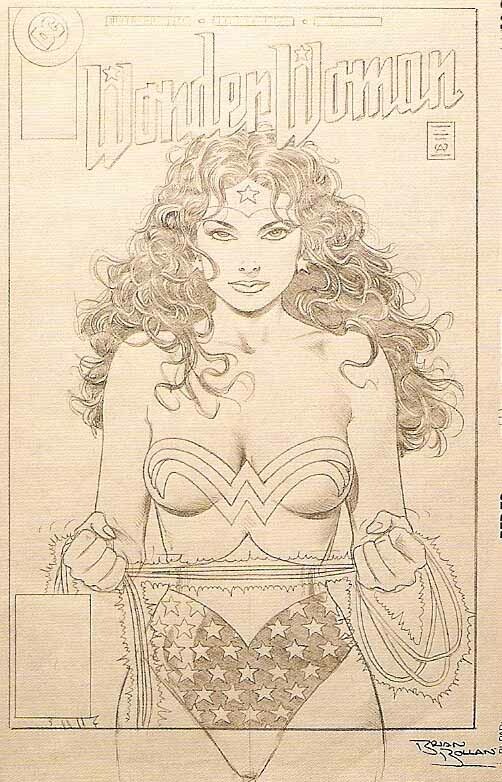 This is from the book “Wonder Woman: The Complete History” by Les Daniels. (Thanks, Tricia!) While a nice change, the logo is very tall, and creates some odd dead space areas above it, though shortening the D would eliminate some of that. For whatever reason, DC decided to give designer Alex Jay a shot at the assignment. Here are some of Alex’s notes from the time, and his sketches. 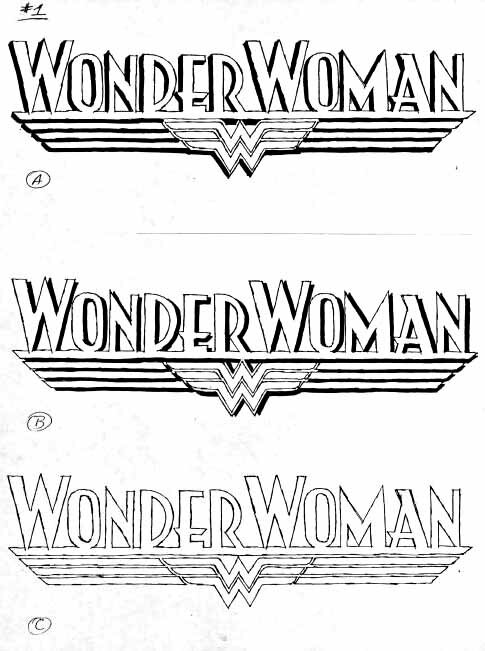 I was being reminded to incorporate the stacked (no pun intended) W’s from Wonder Woman’s costume into my design. 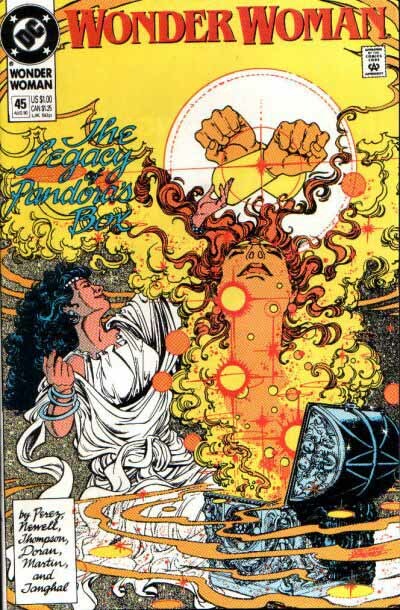 The design first appeared in 1982, issue 288, of the original series. So over the weekend I did logo sketches. Two characteristics that I worked on were sans serif letterforms, and thick and thin strokes. Design #1 shows the letters attached to a bar at the baseline. The stacked W’s are centered with three bars on either side of it. The low crossbars on the E and A are somewhat characteristic of art deco alphabets. I think this design was rejected as too busy because of the bars and small letters. Design #2 used the baseline bar again. This three-dimensional logo had an awkward join at the R and W. The stacked W’s floated above the letters without being part of the logo. Design #3 had nearly all of the elements used in the published logo. The letters are bigger with more contrast in the stroke weights. The stacked W’s play off of the M above it. The single bar echoes the weight of the thick stroke. The letters and stacked W’s come together as a unit. The designs were faxed on October 22. The next day I received a fax from Curtis with his comments on Design #3. The addition of stars to the bar filled in the dead space. Adding serifs was a significant stylistic change from the art deco direction but, as Curtis noted, the serifs did “indicate her classical Greek origins”. I incorporated the changes. The top sketch used curved serifs on the outside of the stroke; the stars protruded from the bar. The middle sketch used curved serifs on both sides of the stroke; the stars are recessed in the bar. The bottom sketch used straight serifs; the stars are on the surface of the bar. Revised designs were faxed on October 28. The next day I began work on the final art, using the middle sketch as my guide. The logo was delivered to Dan Thorsland on November 4. I like this logo, though it’s drifted pretty far from the original Art Deco request. But there are plenty of other art deco logos out there, this one has some unique elements I haven’t seen anywhere else, especially the shape of the O’s. I also like the points on all the diagonal stroke ends, especially on the N. Having the emblem and stars in a separate bar was a good idea, as it allowed them to be covered or totally removed when necessary, yet were a fine design complement when they were there. The narrow telescoped drop shadow gives just enough of a second color to help the logo pop away from the background art, and it all has a classic yet modern feel. Well done. Then all you need is stunning cover art on the regular series by Brian Bolland, and the picture is perfect! 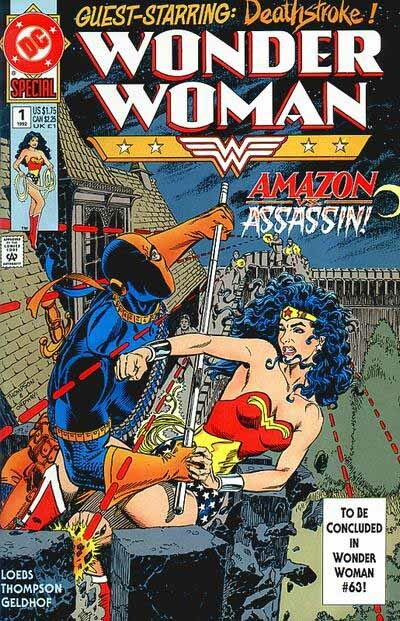 Sure, fans mourned the departure of George Perez, but this wasn’t a bad follow-up, was it? And Alex Jay’s logo would remain on the title for many years to come. Next time we move through the 1990s and into the current decade as Wonder Woman is once more revised and relaunched for a new audience. This entry was posted in Logo Studies on January 21, 2008 by Todd. What a wonderful installment, cheers Todd. I love Alex Jay’s Design 2 – OK, it’s likely too fussy for the regular book but my, it’d look great on the right special project – a Fritz Lang’s Metropolis Wondy book, or something. I was researching something else and stumbled across this topic. It does bring back memories. 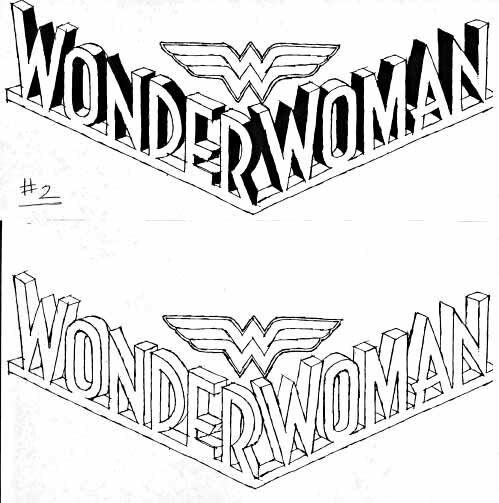 I still think the Wonder Woman logo I did is too cluttered, but it was the highest paying job I ever did for DC, so I can’t HATE it. The biggest problem, which I pointed out repeatedly, was the limitations it imposed on coloring. It HAD to be red, white and blue all the time, even when those colors clashed horribly with the rest of the cover. That skinny little outline didn’t do much to separate the logo from the art, and it just added to the overall busyness and made the words harder to read. This was a poor design choice from the start, and I did do about a dozen alternate approaches, but someone was in love with this idea, so they struggled with it for a few years before giving up. Changes and differences of opinion are part of the job, but this one just didn’t work and it made ME look like I didn’t know what I was doing. As I recall, this was the only time I had such a problematic experience doing a DC logo, but it was a major character title, and I know there were several levels of decision-makers involved, not just Richard Bruning. I think even licensing and marketing were consulted, so by the time I came in it was pretty much decided this was the look somebody wanted. This was the only time I can remember that I was art directed so rigidly. Usually, I would submit a dozen sketches, and occasionally the weakest one would be selected, but I always submitted legible concepts — maybe not all equally inspired, but at least they worked as comic cover logos. Well, most of the time. I think. I hope.